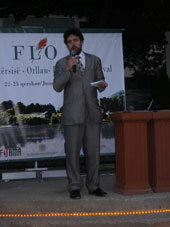 FLONDON is a continuation of the cooperation between Exiled Writers Ink, EWI, and the Festival of Literature in Orllan, FLO, which started in 2011. On the 100th anniversary of the Independence of Albania, EWI presents several authors who took part in this year’s FLO in Kosova. Mirela Sula is a writer from Albania currently living in London. An author of several books of poetry and fiction, she has studied Language and Literature, and has done a Masters Degree in Counselling and Psychology. She has worked as a journalist and is the founder of “Women’s Network: Equality in Decision making” in Albania. Her poems have been translated into several languages. Robert Wilton, is author of a historical thriller, Emperor’s Gold, and translator, mainly of Albanian Literature, into English. He was advisor to the Prime Minister of Kosova in the lead-up to the country’s independence and has held several posts in the British Ministry of Defence, Foreign Office and Cabinet Office. He divides his time between Kosova and Cornwall. Zarghuna KARGAR, from Kabul, is author of Dear Zari, a collection of 13 stories of Afghan Women. When civil war broke out in Afghanistan, she and her family fled to Pakistan. In 2001 her family sought asylum in the UK, and she started working for the BBC World Service Pashtu Section. Zarghuna lives in London. 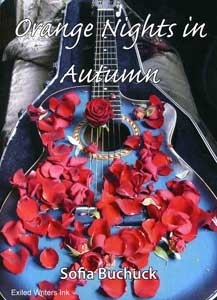 Mark Nelson is a new and thrilling talent, a blues balladeer (acoustic guitarist & singer/songwriter)! He was voted Best Support Artist 2010 at the Guildford Music Awards 2010, and has performed in the UK and abroad. Mark is the author of the original score for the FLO Festival. He is about to release his first album ‘In from the Cold’ on iTunes. 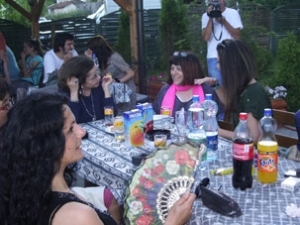 Organised by Valbona Ismaili Luta, active EWI committee member since the establishment of the organisation in 2000. Excerpts from a new translation read by Rahima Mahmut. Söyün’gül Janishif was born in 1940 into a middle class family in the capital of Urumchi in China’s north-western Xinjiang Uyghur Autonomous Region, also known as East Turkistan. While studying medicine at university she became involved in student politics, and was arrested and imprisoned. “The Land Drowned in Tears” is based on her secret prison diary, kept between 1957 and 1981 during her time in prison and labour camps in Xinjiang. It provides a unique first-hand account of the extremism, terror and violence of the Cultural Revolution as experienced by Uyghurs. information for all. It campaigns for the release of imprisoned writers, for free media, for the right to one’s mother tongue, and for other rights related to freedom of expression. Uyghur PEN’s focus of expertise is on western China and Central Asia. 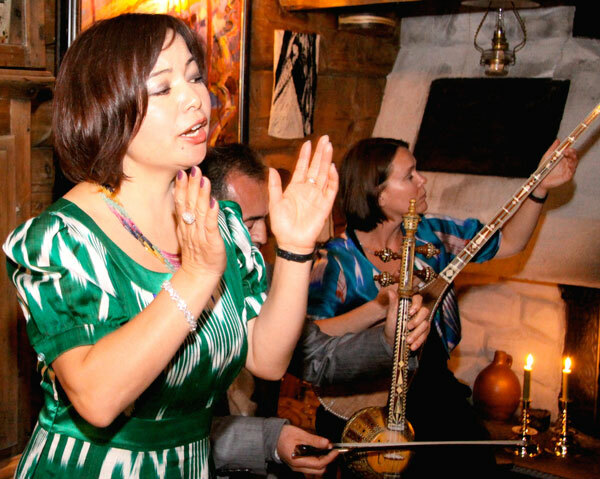 A London-based group playing traditional and popular music of the Central Asian Uyghurs. LUE made its debut at the London South Bank ‘Sanctuary’ festival for refugee music in 2005, and (among many other gigs) has performed at St Ethelburgas Centre for Peace and Reconciliation, and Norway’s Forde ‘Freedom and Oppression’ Folk Festival. Toby Davidson is a West Australian poet now living in Sydney as a lecturer in Australian literature at Macquarie University. He is the editor of Francis Webb Collected Poems and an upcoming critical study Born of Fire, Possessed by Darkness: Mysticism and Australian Poetry (Cambria Press, 2013). His own poetry has thrice featured in Australia’s major yearly anthology Best Australian Poems in 2007 and 2011 and in December 2012 his debut collection Beast Language will be launched by Melbourne’s Five Islands Press. Chuquai Billy is a Native American writer, poet and comedian from the Lakota Sioux/Choctaw Nations, originally from Gallup, New Mexico, now based in London, UK. 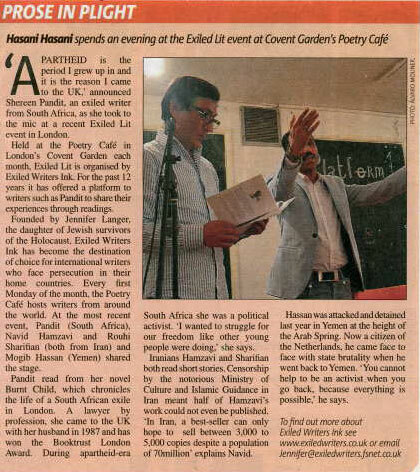 An award-winning poet, a novelist and short story writer, Bashir has lived in Europe, Asia, Africa and Central America and has worked for a number of international organizations such as the United Nations, the European Union, the Asian Development Bank, The International Red Cross and NGOS. His latest novel MAARGIR The Snake Charmer is nominated for Asia Man Literary prize. His poetry collections include ‘The night Stories’, winner of the first prize from the Afghan Writer’s Association for poetry in 1978. His other poetry books in Persian ‘in loneliness cocoon’ and ‘Eastern Chlorophyll’ have been translated into many languages. 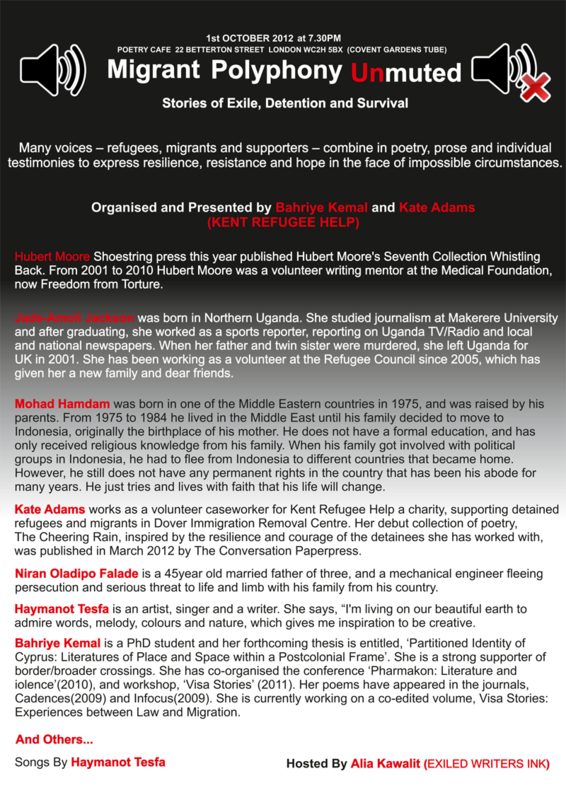 was a South African lawyer and political activist before coming into exile in the UK in 1987. Her short stories have appeared in many anthologies and magazines and have won several prizes, including the Book Trust London Award. She also writes articles and reviews for newspapers and magazines. Hom was born in 1971 in a mountain village in Nepal, the youngest of nine siblings. His first book, published in 1989 at the age of 19, was the poetry collectionDhoon Napayeka GeetHaru [‘Songs Without Melodies’], followed in 1991 by his biography of a famous Nepalese singer, YatraHaru Narayen GopalKa [‘The Journeys of Narayen Gopal’]. His first published novel Yaad Harayeko Maanchhe [‘The Lost Memory Man’] became an overnight bestseller in 1992. Two further collections followed: Parichaya Tyo [‘The Identity That’] in 1994, and Lukdainan Manaka ByethaaHaru [‘The Soul’s Pain Wont Hide’] in 1995. His second novelSamaya Pari (Beyond Time), which is due for publication in London in 2010-11, is set in Nepal, Bihar and Kolkata, India. It is about the plight of the street children of Kathmandu and the sufferings imposed by the caste system in some South Asian countries. Since 1996, Hom Paribag has lived in London.In 2004, he founded the English language publication Society Today Magazine, which is published in hard copy and online (www.society-today.com). Born in Shiraz, Iran, Navid graduated in Iran with a bachelor degree in metallurgy. He has published a collection of short story titled “Rag-and-bone man” more than half of which was censored by the Ministry of Culture and Islamic Guidance. Having difficulties to publish his stories, he recently came to London and has given reading & performance at various festivals such as “East Finchley Art Festival” , “Hardy Tree Gallery” and “Exiled Writer Ink” and “Brighton Festival”, and some of his stories appeared in English magazines such as” Carillon magazine”. His current novel is under translation. Farayi Chikowore: Farayi Chikowore is a Zimbabwean who writes poems in English. He is an asylum seeker. He recently fled Robert Mugabe regime. He was a teacher in the rural areas of Mhangura which is one of the remote places. He was severely beaten by Zanu PF youths. During one of the beatings he lost a front tooth and lost his mental faculties as well. As a result was detained in mental health institution. When he recovered, he fled Zimbabwe. Amanda Epe: Amanda Epe writes poetry and short stories on themes such as gender, ethnicity and spirituality, and her writings have been included in Shangwe anthologies. Her poems featured in Strand Book of International Poets 2010, highlights the ethnic struggles in the Niger Delta. She wrote the poem “Seri” as a tribute to the late Major Isaac Jasper Boro a pioneer for minority rights activism of the Niger Delta. Takudzwa Mukiwa: Taku Mukiwa is a musician from Zimbabwe who plays the country’s iconic musical instrument the mbira,. His music is drawn from the traditional Shona repertoire with modern lyrics that run commentary to some of the issues affecting Zimbabweans both at home and abroad. First and foremost, Bart sees himself as a wordsmith whose love lies with the English language. To win a recent National poetry competition is the first real recognition Bart has had since immigrating to the UK in 2003 despite over thirty years of working with the written word. After many years in the advertising industry in Zimbabwe, involved with both electronic media and print, Bart developed as an independent writer and theatre director responsible for running workshops throughout southern Africa often based on human rights. Some of the organisations he worked with in Zambia, Mozambique, Namibia and Zimbabwe include the Catholic Commission for Justice and Peace, the British Council, The Goethe Institute and Alliance Francaise. He initially brought a team of actors to London and Edinburgh to perform six of his plays in 1997. His own portfolio, which includes plays, novels and poetry, reflects his passion for giving voice to the voiceless, minorities and dispossessed individuals. An essay on exile and alienation, FLOTSAM, was published by Exiled Writers Ink, for whom Bart is a committee member and has written a great deal in recent years including feature work on the suppression of the artist’s voice in Zimbabwe, one of the primary reasons why he had to leave Africa behind. He has been interviewed on BBC Radio One since being here as well as by German Radio and an Independent Zimbabwean radio station broadcasting from London to Africa. Jade Amoli-Jackson is a torture survivor from Uganda. She is a member of Write to Life a group of torture survivor from Freedom from Torture. Can victims of conflict ever engage in conciliation? Is forgetting impossible? Ali was born in Cyprus. Her short stories and translations of poetry have appeared in international anthologies and journals. She has set up empowerment projects in the UK and Cyprus focusing on young people, women, education and the Arts. She is a passionate intellectual activist for justice in multicultural, multilingual communities. She is the author of Turkish Speaking Communities and Education – no delight (2001), editor and translator of Turkish Cypriot Identity in Literature (1990) and advisory editor to Cadences. Pink Butterflies/Bize Dair (2005) is her collection of short stories and sister’s poetry. Forbidden Zones, a selection of her short stories and creative pieces is due out in 2012. Thomas Orzsag-Land is a poet and award-winning foreign correspondent writing for global syndication mostly from London and his native Budapest. His poetry has been published by the BBC World Service, The New York Times and The London Magazine, his reviews and polemics by The Times Literary Supplement, The Jerusalem Report and Foreign Policy/Washington. His next book will be The Survivors: Holocaust Poetry for Our Time, to be published by Smokestack, 2014; his last one was Christmas in Auschwitz: Holocaust Poetry, translated from the Hungarian of András Mezei, Smokestack, 2010. Dumi Senda is an internationally recognised multi-award winning poet of Zimbabwean origin nicknamed “Voice of the voiceless”. He has performed throughout the world in support of humanitarian causes and has run numerous workshops for chairities, schools, universities and community groups. His poems have been archived at Stanford University as part of the “Poets for Peace” initiative and he used to teach children in Kampala, Uganda. Yuyutsu R.D Sharma is a distinguished poet and translator. He has published nine poetry collections including, Milarepa’s Bones, 33 New Poems, (Nirala, New Delhi 2012)and Nepal Trilogy, (www.Nepal-Trilogy.de, Epsilonmedia, Karlsruhe, 2010). 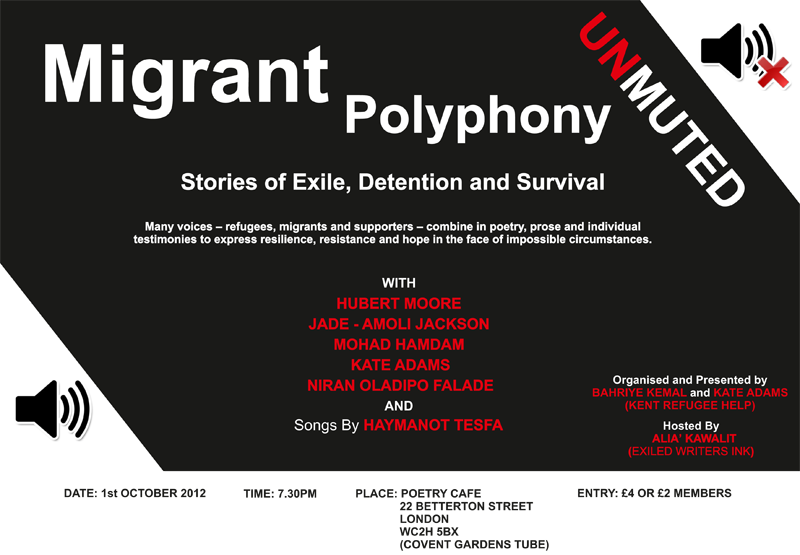 Visiting Poet this spring at New York University, in June, he will participate as Guest Poet at the Poetry Parnassus Festival organised to celebrate London Olympics 2012. Half the year, he travels the world to read from his works and conduct creative writing workshop at various universities in North America and Europe but goes trekking in the Himalayas when back home in Nepal. Edin Suljic was born in a multicultural, multi-ethnic part of former Yugoslavia, now Bosnia and Herzegovina. He arrived in the UK at the onset of the tragic Yugoslavian war in 1991. His creative output ranges from producing short films and theatre projects to photography and writing for film, short stories and poetry. He has worked with young people, in England, on summer camps and in schools with Exiled Writers Ink and Academi. 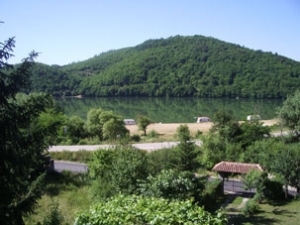 His most recent theatre project, ‘Writing Home”, performed in Bosnia and Herzegovina, was in collaboration with writers from London and Mostar and Tuzla under the umbrella of Exiled Writers Ink. is a Pakistani American novelist who writes in the English language. Shamsie’s first novel, In The City By The Sea, was published in 1998. Her second novel, Salt and Saffron, followed in 2000, after which she was selected as one of Orange’s 21 Writers of the 21st century. Her fifth novel Burnt Shadows was shortlisted for the Orange Prize for Fiction. Her books have been translated into a number of languages.She is also a reviewer and columnist – primarily for The Guardian. He has published two books of poetry based on the Sufi poets Rumi and Attar. A writer, poet, public speaker, and broadcaster on a number of topics. 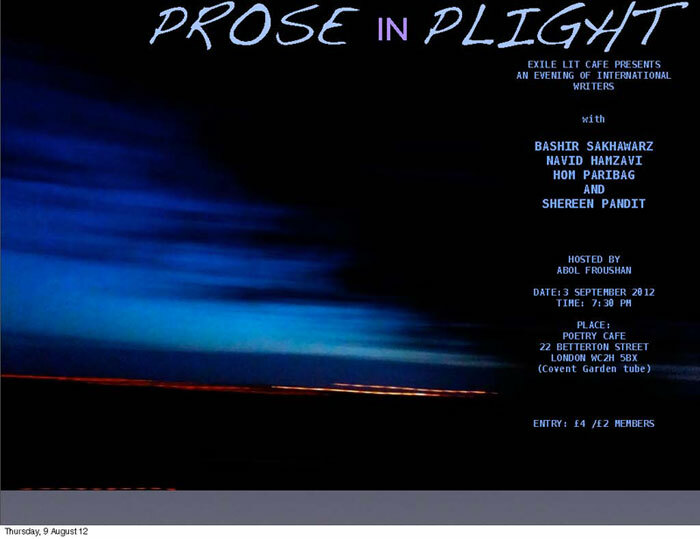 He has been trustee of the Poetry Society and Planet Poetry and is a trustee of English PEN. He is also currently an Associate Non-Executive Director of South West London and St. George’s Mental Health NHS Trust. In 1999, Raficq was awarded an MBE for his interfaith work. Burmese, a former political prisoner, artist, comedian, performance artist and writer. He currently lives in London where he is working on a number of arts projects connected to Burma, and his own practice. Mehrangiz Rassapour (M. Pegah) is a poet, literary critic and editor of Vajeh (cultural and literary magazine). Her first book of poetry is entitled Jaragheh Zood Mimirad (Spark Dies At Once) published inIran in 1990. This was followed by her second collection . . And Then The Sun (. . . Va Sepass Aftaab)published in England. Her third book Beyond The Flight Of The Bird (Parandeh Digar,Nah)published inGermany, won great acclaim. Her works have been published in several languages, such as English, (by poet and translator Robert Chandler), French, German, Norwegian and various others. She was on the executive committee of ‘Iranian Writers in Exile’. Haim Bresheeth is a prominent anti-Zionist activist who is a poet, filmmaker, photographer and film studies scholar at the University of East London. He His films include ‘State of Danger’ (1989, BBC2), a documentary on the first Palestinian Intifada. His books include Introduction to the Holocaust (1997) and his edited volumes include The Gulf War and the New World Order, (with Nira Yuval-Davis) (Zed Books, 1992) and Third Text (September, 2006) on Palestinian and Israeli Art, Photography, Architecture and Cinema (co-edited with Haifa Hammami). N. DHARGYAL FROM TIBET is a poet whose book is entitled The Jasmine Revolution and other poems. He uses poetry as the tool to raise awareness about Tibet and brings a unique perspective to his work; to N. Dhargyal poetry represents both a channel for drawing support to his country’s struggle for independence and an antidote for dealing with his own frustration at being stateless. Barbara L. Lopez: Colombian poet and writer will present some of her poems in Spanish and English. Luz Mar: Colombian poet will share her latest work. Sofia Buchuck: Peruvian poet and song writer will present her latest poems “Respect the Pachamama- Mother Earth”. Her songs are symbolic of the Andean heritage with influences such as Violeta Parra performed in collaboration with other artists. Calu Lema: Visual artist-writer will present some of her narratives reflecting themes of London life. Giovanna Quintero: With a reflective short history of Bucay, a celebrated Colombian writer on the theme of love. Jorge Elkin Gonzales: From Colombia, photographer and poet will share his poetry in both languages. Martha Nubia Beltran: Colombian poet will perform her poetry on living in London. Two visual artist, Luz Acevedo from Colombia and Soraya Fernandez from Ecuador, will share their art. Sevillana Dance by: Nelly and Inmaculada Marin from Spain. Adnan al-Sayegh is from Iraq where his criticism of oppression led to exile. He was sentenced to death after he published ‘Uruk’s Anthem’, a book-length poem, and took refuge in Sweden. Eleven collections of his poetry in Arabic have been published. He has won several internaitonal awards and his poetry has been translated into many languages. Exiled Writers Ink published a translation of his work entitled The Deleted Part (2009). Pete Godismo is from Nigeria. He is a poet, playwright, short story writer, essayist and actor/director. His two volumes of poetry are A Snake in the King’s Palace and Miffed. He has performed his work at numerous events and festivals. Yvonne Green is an observant Jew born in England in 1957. All her grandparents originated in the Central Asian Emirate of Boukhara, her mother was born and raised in British Egypt, her father was born in Berlin, raised in Paris, incarcerated at Gurs and later held as a British P.O.W. at St. Denis. Yvonne’s publications include, Boukhara, a 2008-9 Smith/Doorstop prizewinner, The Assay, (Smith/Doorstop 2010), After Semyon Lipkin, (Smith/Doorstop 2011) a Poetry Book Society award winner. MUSIC by Alexander Hart playing the Okinawan Sanshin.